I have flashes of memories of Frank Sidebottom’s public wake, which took place in Manchester’s Castlefield Bowl for an audience of 5000 following Frank’s – or rather Chris Sievey and Frank’s – death, in the summer of 2010. I vaguely remember them throwing Little Frank, Frank’s ventriloquist dummy, in the Manchester ship canal. I think I remember there being an Egyptian-style sarcophagus on stage which purported to contain the mummy of Frank. It had his face painted on the outside, with those beautiful blue eyes mooning out at the crowd. At one point, I’m sure Elvis and Jesus came down from heaven to assure the crowd that Frank was settling in just fine. There were videos of his animations, and a film of Frank breaking into Smiths drummer Mike Joyce’s house, and there was a performance from a band called The Refreshies, after Chris Sievey’s own group The Freshies. Mostly, I remember thinking: is he really dead, or was this all a dead brilliant prank? Beloved of the music scene, particularly in Manchester, Frank introduced both The Smiths at Manchester GMEX and Bros at Wembley while each was at the height of their fame. He performed at Reading Festival, toured around the UK and released a series of records in which he’d cover songs in his own inimitable style – one particularly illustrative example was called ‘Frank Sidebottom Salutes The Magic Of Freddie Mercury And Queen And Also Kylie Minogue (You Know, Her off “Neighbours”)’. Chris’s daft sense of humour was evident in The Freshies, but so was his innovative, artistic spirit. In a pre-YouTube age, he was a very early adopter of the camcorder, which he’d use to produce longform Freshies videos. When fans ordered them, he’d personalise each one with messages from Frank, who was invented as a demented Freshies super-fan. Frank would support The Freshies at gigs, and – to Chris’s frustration – would go down a storm with the crowd. Eventually, Chris gave in, and started performing as Frank full time. When he did so, he remained resolutely in character – Frank was a method piece, and the papier-macher head gave him perfect anonymity. “I think the mystery was a big part of the appeal for his audience,” says Steve. Steve’s personal interest in Frank began when he was working at a comic shop in Preston, Lancashire, in the 1990s. Frank had been booked to make a personal appearance at the shop’s other branch, in Blackpool, and called the shop to check the arrangements. It was Frank, not Chris, to whom Steve answered the phone. Having just had a brief conversation with “the most famous person I’d spoken to at that point”, Steve watched as his boss discussed arrangements. Steve speaks warmly about Frank, but even more warmly about Chris, who seemed to be able to turn his hand to anything. 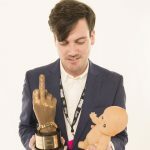 As Frank, he had a beautifully drawn comic strip in the comic Oink (also home to early work by Black Mirror’s Charlie Brooker), he programmed video games (even, pointlessly, putting one on the B-Side of a Frank Sidebottom single, which required the user to tape it themselves) and took up a latter-day career as an animator before his death at 54. Sievey’s family gave Steve carte blanche to tell the warts-and-all story in his own way. But mostly, what he uncovered were heartwarmingly human stories about a brilliant, if flawed, man. In the film, Chris’s son tells the story of how during his parents’ separation his dad asked him what he wanted for Christmas. He said: “You”. So Chris wrapped himself head to toe in wrapping paper and stood there, fag in mouth, in the living room on Christmas morning. The family can be heartened that the film does Chris’s legacy proud, and the archive materials that went into its making have now been accepted by Manchester Central Library to be preserved in perpetuity. They were, before the film, rotting in a cellar and bound for the dump. Fans, too, can be pleased that Being Frank erases memories of Frank, the Hollywood bastardisation of the Frank Sidebottom story in which Michael Fassbender played a papier-macher head-wearing artist. It was serious and pretentious and, you suspect, Frank may have deemed it bobbins. Steve can’t. “I actually signed a non-disclosure agreement to not express any opinions about it,” he says. Ironically, that’s the last thing Frank would have wanted. The film Being Frank: The Chris Sievey Story is in cinemas nationwide now. The soundtrack album, featuring the music of Chris Sievey, The Freshies and Frank Sidebottom, is available to buy on picture disc vinyl and CD.